Chicago Shell Club – Caution! Shell collecting may become addictive! The Chicago Shell Club is for people who enjoy collecting and learning about seashells! HOSTS OF THE 2016 CONCHOLOGISTS OF AMERICA CONVENTION!! Founded in 1964 in the Chicago Field Museum of Natural History, our regular meetings are now conducted at the North Park Village Nature Center at 5801 N. Pulaski in Chicago. Meetings run from 1:30 to 4:00 p.m. on the second Sunday of each month, from September through May. In addition to the Club meetings at the Nature Center, some special events are: open house meetings held at members’ homes, field trips, shell auctions, and our annual St. Nick & Neptune Christmas party. See the meetings tab to find our when the next meeting is being held. Programs, generally, are presentations given by shell experts from around the country. Lively discussion is the rule, and members also present information about Eco Adventures, recent collecting trips, their latest shell acquisitions, and aspects of the hobby in which they’re interested. The May and December meetings include shell auctions to raise money for the club. We have silent and voice auctions, with bidding beginning at affordable prices. Through the years, these auctions have enabled some members to build beautiful collections which they might not otherwise have been able to assemble without extensive travel. 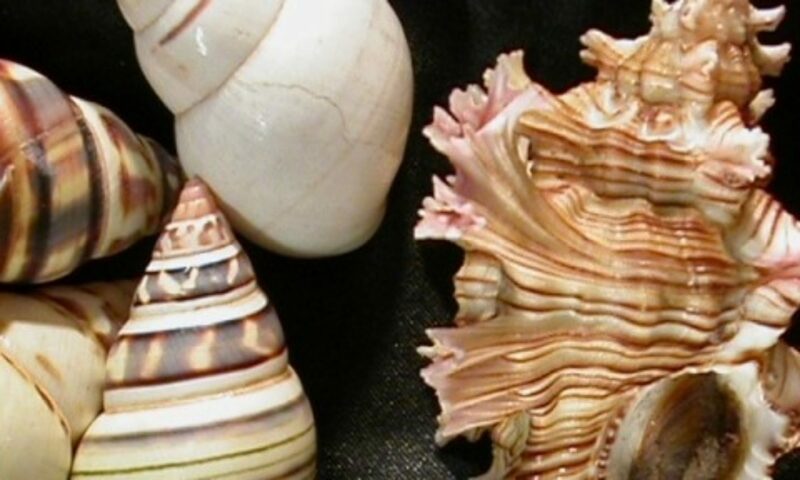 Besides travel, collection, classification and preparation techniques, many other aspects of shell collecting come up at meetings, including shellcraft and shell art. Collecting books about shells is another interest shared by many members. However, it is not necessary to buy many books to keep up with the latest information. The Club’s extensive library is available for lending to members. Club membership ranges from novice to expert, and from juniors to retirees. Many members join the Club after an initial shelling experience that they are eager to continue. All are there to share and increase their knowledge about shells and the ecosystems in which they exist. Dues are $25.00 per calendar year for families, $20.00 for individuals, and $15.00 for juniors (under 18 years). You do not have to be a member to attend our meetings or auctions. The current Chicago Shell Club meeting schedule is available on the Meetings page in this website, providing details of the scope and variety of scheduled meetings and events throughout this Club season. We eagerly look forward to seeing you at our meetings!